North and South maps with the Game of Thrones logo on the other side! Set includes 2 throw pillows. Luxurious velvet 14-inch square throw pillows with antique gold rope trim! 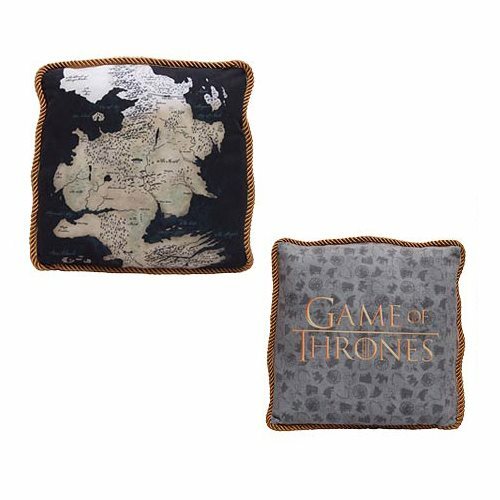 These Game of Thrones Westeros Map Throw Pillows feature highly detailed maps of Westeros printed on a luxurious velvet with antique gold rope trim. The maps feature all your favorite locations rendered in exquisite detail. The Game of Thrones TV show logo is featured on the back. The map is printed on one side while the Game of Thrones logo is printed on the other. Each pillow measures 14-inches square. Ages 15 and up.